← Learning how to cover up superbugs? The number of beds has been reduced by almost a half – seemingly on a permanent basis, with no public consultation whatsoever. It’s also clear that bed numbers have been sharply reduced within the last two weeks. Is this to justify the Community Trust’s claim that closing Stretton Ward (or running two wards in one clinical area, as they maintain) does not involve any reduction in bed numbers? 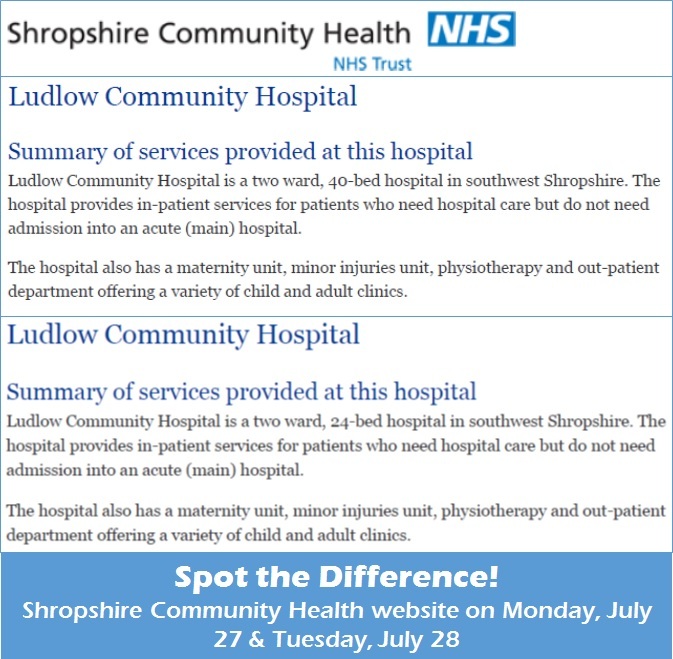 Yesterday, Andy Rogers (Communications and Marketing Manager) told patient representatives on the Ludlow Hospital Task Force ‘There will be no reduction of beds when we move to one clinical area… We intend to move to this arrangement on Friday, 31 July, when there will be 24 beds. On Saturday, 1 August, there will still be 24 beds’. But exactly when did that magic number of 24 beds come about? Supporters of Shropshire Defend Our NHS visited Ludlow Hospital yesterday. Staff confirmed that there are currently 12 male beds on Stretton ward and 12 female beds on Dinham ward – 12 beds on each ward, 24 beds in total. But our supporters were also told that until recently there were 19 beds on Dinham ward. On Dinham ward, 7 female beds have gone missing. We’ve spoken to Pat Hansen, a volunteer coffee lady on Stretton ward for the last 13 years. Pat has this to say: ‘There have normally been more than 12 patients on Stretton ward in the past couple of months. In fact two weeks ago there were 17 patients on the ward. The NHS says only 12 beds were in use – I don’t recall seeing five patients sleeping on the floor’. Pat served tea or coffee to 17 male patients less than two weeks ago. On Stretton ward, 5 male beds have been lost. Gill George, speaking for Shropshire Defend Our NHS, said ‘There’s a smoke and mirrors game being played here. The refurbishment of the hospital was originally used as an excuse to cut bed numbers. Beds were then put back because there is a clear clinical need for them. Now they’re taking away the beds for good – and playing games to pretend it isn’t happening’. The Community Trust maintains that staff at the hospital came up with the idea of merging wards (News Release, July 24th). Perhaps. We’ve been told, though, of a ‘gagging order’, a letter sent to staff instructing them that they can’t discuss the move to one ward. We’ve also been told of hospital staff who are fearful for their jobs and for the future of Ludlow Hospital. If staff support is there, why tell them they’re not allowed to speak out? Ms George added, ‘There should be no pretence that staff support the running down of their hospital. There’s also no place for gagging orders in the NHS. Senior managers at the Community Trust should be ashamed of themselves. The closure of a ward and the savage cuts to bed numbers are a mistake, and the decision should be reversed’. All the money and services are going to Telford the only explanation is services will benefit the West Midlands to the detriment and danger of the majority of the residents in Shropshire, Their foregone conclusion consultations in 2011 were highly questionable!!! it is the only explanation for what they did and what they are doing to the people of Ludlow now. Do not trust them to build an emergency centre it will never happen, look no further than their press release in 2011 roof will imminently collapse in consultant led maternity at RSH one of many lies and promises made to send services to PRH. Thinking of the promised refurbishment for 2011 in matenity was in any event poor recompense for losing consultant led servicesf now shelved midwives still working under that dangerous roof!!! There needs to be a public enquiry about everything they have done and are doing currently. Good luck with the fight for the people of Ludlow it is a disgrace, their consultations are foregone conclusions. Unfortunately our MP’s and councillors sit back and do nothing not one of them has voiced support to fight on behalf of Shropshire,.